A fancy underbust, hip bucket corset workshop, just like my green laced one seen at the asylum, suitable for beginners too! Choose from a variety of coloured corset satins and ribbons and make one to fit you perfectly. and learn the fancy self lacing technique. You just need to be able to use a sewing machine competently for this course, no previous corsetry experience required, though intermediates also welcome. All materials provided. 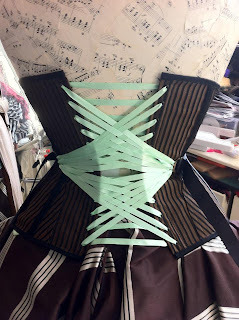 Brand New Fan lacing Corset. Mini Top hats and Tricornes. A favourite workshop creating couture style hats using traditional victorian techniques in assorted lush silks, velvets and brocades. Beginners welcome, there is a little sewing involved on this course but it's mainly handsewing and gluing! all materials provided, though you may bring your own outer fabric and trims if you want to match an outfit. 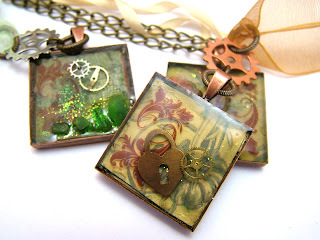 Have a go at a vast assortment of techniques and play with a wide variety of materials to create wonderful components and pieces for your steampunk jewellery, with metal, resin, polymer clay, shrink plastic and more. You don't need to bring anything, but feel free to bring your "stash" of beads and watchparts to incorporate into your designs as you learn new things. All equipment and basic materials supplied. I won an award!!!! 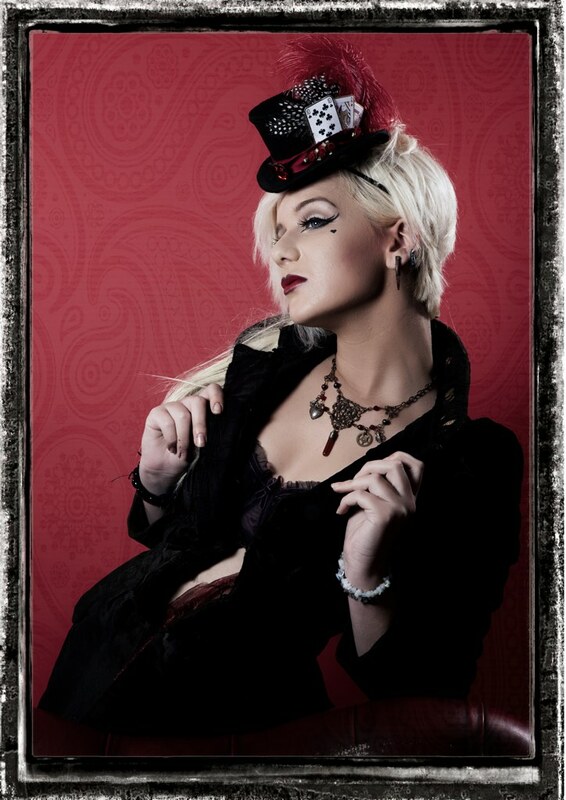 I still can't quite believe it, but "Steampunk Emporium" was voted the best non fiction steampunk book of 2011/12. I am so thrilled to have won, a huge thankyou to everyone who voted. It genuinely was most unexpected. Sowhat a terribly exciting and busy weekend that was! It went by in a flash and I know I didn't get to see a quarter of the things I'd intended to, or indeed the people I'd have loved to chat with, but It was jolly good fun anyway. Despite hiding from the heat (and the First Tea Companies First Court Martial) in the lovely cool assembly rooms in Lincoln, I managed to do quite a lot really! I sat on a panel about the nature of steampunk writing with the lovely Raven Dane and awesome Jonathon Green which was jolly good fun. I saw Mr B the gentleman rhymer play, I helped judge the costume competion with Jonathon and the very talented Mr Thomas Truax. Even MC Elemental got me up on stage to sing a song to me, which was very silly indeed. I'm afraid I was so busy I didn't take many pictures! though on the left you can see Mr Rivett pretending to be Kit Cox...myself and the irrepressable Ms Peacey and Nick Locke being Steam Trinians, and the lovely Lady Raygun and Robert Rankin relaxing.... but there are links to many many wonderful photos on the VSS facebook site, Now we only have to wait till March for The Great Steampunk Beach party!